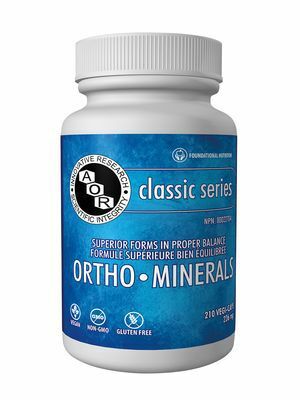 Ortho• Minerals is designed to be a balanced, effective mineral supplement, providing only the best forms and optimal ratios and doses of each ingredient. This formula reflects true orthomolecular medicine. Ortho• Minerals contains vitamin D and 13 minerals, some of which are essential and some that are not recognized as essential but are suggested in research to have important biological effects. Primary Uses: Every cell in the body requires minerals. It is thought that minerals promote an optimal pH, and that an acidic body or poor nutrition will actually draw minerals from the body into the blood and eventually excrete them, resulting in diseases such as osteoporosis. Minerals must be in a balanced and absorbable form in order to receive the most benefits from them. Mineral depletion may be the biggest cause of poor health, illness, and premature aging facing a substantial percentage of the population. The amounts of minerals in typical multivitamin/multimineral formulations are inadequate; for many people, a separate multimineral formula like Ortho• Minerals is the best solution. Mineral supplements can benefit almost anyone since most North Americans face borderline mineral deficiency due to the following factors: poor food choices, food processing, soil depletion from agribusiness factory farming, and mineral antagonists such as phytic acid, oxalates, caffeine, alcohol, and refined sugars along with other high-glycemic dietary carbohydrates. Take up to 7 capsules daily with food, or as directed bya qualified health care practitioner. Take a few hours before or after other medications. CAUTION: Some people may experience diarrhea. Consult a health care practitioner for use beyond 6 months. Do not use if pregnant or breastfeedinf. Contains soy.